I was talking to a person today who was trying to get a grasp of why people do evil things and why does God allow it. Truthfully, there is no fully satisfying answer to this (or at least not universally satisfying). Denying God, in my mind, just shifts the issue to a more strictly ethical one, but does not solve it. In the end, however, I feel that as important as questions of theodicy might be… they are not the most important. I thought of a silly short story at the time. I decided to utilize the three little pigs. Although the story has nothing to do with a big bad wolf… I figure I can borrow them for a different story. 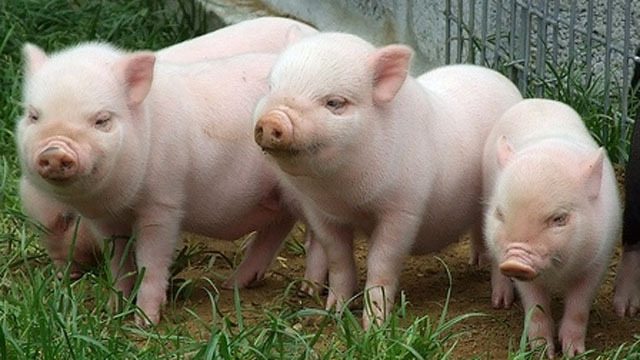 Once upon a time, there were three little pigs. Each one had had trouble with a wolf in the past, and had gained some great insight in both self-protection and building codes. Each lived in a nice brick house. But there was trouble in their new paradise. The first little pig came home one day and found his house filled from bottom to top with manure. What a horrible thing to do to his nice house. He began to wonder who would do such a thing? A neighbor who did not like pigs? A relative of the B.B. Wolf seeking some petty revenge? Perhaps it was a strange, previously undocumented, weather phenomenon that caused the accumulation of manure in his house. He thought on these things and thought on these things and thought on these things. He knew that if he thought long enough, he would solve the mystery. All the while the manure continued to break down and make his house unlivable. The second little pig came home on the same day to his house and also found it filled from bottom to top with manure. He also thought about who or what caused this to happen… only natural. But then he set to clean his place out. He worked all day, digging and moving, and scrubbing. Eventually, the manure had all been removed from the house, and the house was again clean… although the surrounding yard was a now an unsightly and smelly mess. The third little pig came home after work and found his house in the same condition as the others After a reasonable time considering the whats and whys of the situation, he resolved to correct it. So he worked all day to clean out his house. He took out all of the manure and made his house clean like new. The manure he put on his plants in the garden and now he has the nicest flowers and vegetables in the village. Reflection is thinking about the hows and whys of things. Seeking to determine meaning and causation. This is a worthwhile thing to do… we were designed by God to seek patterns and meaning… but if we stop there, we haven’t done enough. Restoration is undoing what was wrong and returning things back to their original state. This is important. But it is a shame if one stops there. Redemption is creating good from the bad. Restoration seeks to negate the bad. Redemption seeks to transform the bad into better (better than it was before). God is a redemptive god. We can and should reflect on the evil around us. We should seek to restore what has been damaged by evil. But we should also work to redeem evil… finding a way to create good in it… like beautiful vegetables and flowers from manure.